When panels are initially created, they are of a default length of 1 second, displayed in timecode format. When it comes to your animatic, you will want to be more accurate. Modifying the duration of a particular panel is key when working out timing. There are a few different ways to accomplish this. In the Timeline view, it is very easy to change the duration of a panel just by dragging to resize it. This way you can easily see the length of your panels in relation to one another. 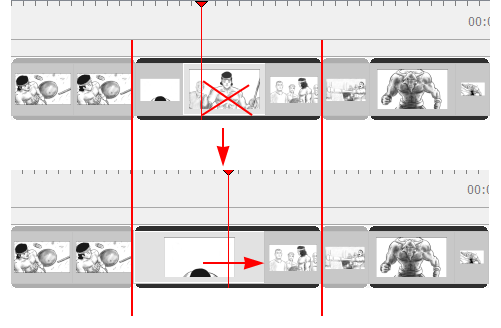 There are two ways to resize a panel in this way, depending on how you want the change to affect subsequent panels. Use this method when you are not concerned about modifying the position of all subsequent panels. Place the cursor over the end (right side) of a panel. Drag the edge of the panel left or right to set the desired length. Using this method, all subsequent panels will be shifted along with the selected one. While you drag, the new duration of the panel as well as the difference between the former duration are displayed in a black box for accuracy. This value can be displayed in either frames or timecode. Use this method if you need to keep subsequent panels exactly where they are. Hold the [Alt] key, then drag the edge of the panel left or right to set the desired length. Only the panel directly after the selected panel will be changed. A very accurate way of setting the duration of a panel is to use the Panel view. The Panel view will display, amongst other things, the exact Time Code information for the selected panel. 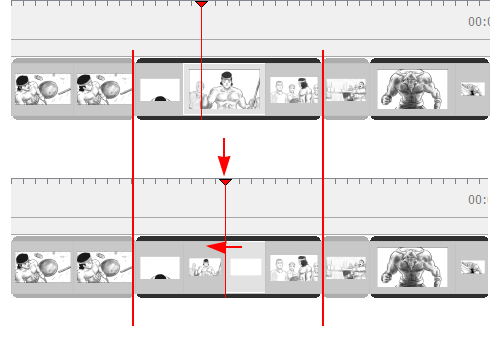 In the Timeline or Thumbnail view, select a panel to adjust. Go to the Panel view. In the Duration field, use the up and down arrows or directly type a value to make the selected panel longer or shorter. You can split your current panel into two pieces. Following this operation, you will have two identical panels generated from the original. All elements, including layers, will be in both panels. Each panel’s length will be determined by where you have the red playhead when you perform the operation. 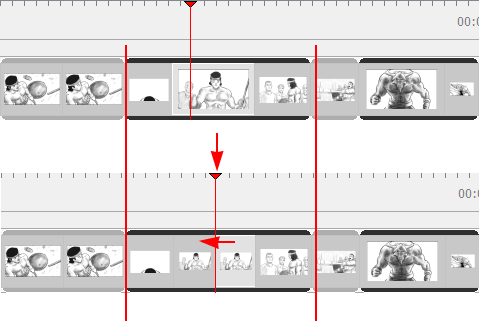 In the Timeline view, drag the red playhead to where you want the panel to be split. ‣ From the top menu, select Storyboard > Split Panel At Current Frame. 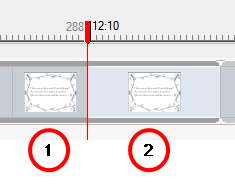 ‣ In the Timeline view, right-click in your selected panel and select Split Panel At Current Frame. Your panel is split into two pieces, precisely where the red playhead is positioned. NOTE: You may have to adjust any layer transformations you created before splitting the panels. By using a series of keyboard shortcuts, it is possible to select a panel and all the panels following it at once. These options are also available on audio tracks—see Sound.